Elyria City Hall is located at 131 Court Street, Elyria, Ohio 44035; phone: 440-326-1400. Elyria is the seat of government for Lorain County. Photo: Horace C. Starr House, ca. 1857, 284 Washington Avenue, Elyria, OH. Listed on the National Register of Historic Places in 1979. Photographed by User:Nyttend (own work), 2013, [cc0-by-1.0 (creativecommons.org/publicdomain/zero/1.0/deed.en], via Wikimedia Commons, accessed January, 2014. Elyria was settled by Heman Ely and a party of pioneers from Connecticut in 1817. Ely had acquired a large tract of land in the Western Reserve through his father, Justin Ely, who was a shareholder in the Connecticut Land Company. The new settlement developed rapidly and by 1822 the state legislature was requested to form a new county for this area. In 1824, Lorain County was created and Elyria was designated as the county seat, largely through the generous donations of land and money by Heman Ely toward construction of a courthouse. In 1833, Elyria was incorporated. Its name was chosen by Heman Ely as a unique combination of the Ely name and ancient Greek land of Illyria, which coincided with a period of American history in which Greek architecture and Greek names were emulated in new settlements. The arrival of a major railroad in the 1850's strengthened Elyria's position as a commercial center for the surrounding countryside. 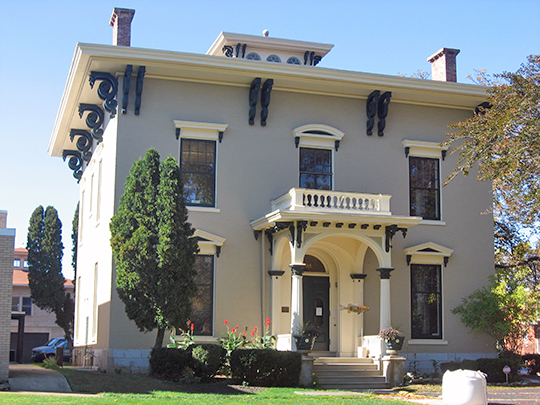 The resulting growth and development of the community, particularly after the Civil War, resulted in many new buildings being constructed, primarily in the Italianate style. Many of the buildings in downtown Elyria date from the late 19th century. The early twentieth century saw Elyria grow, but this growth was largely in the form of residential neighborhoods near the new factories on the east and west sides and for people working in the steel mills in Lorain. Little growth or change occurred in the downtown or older residential neighborhoods. In the years since the second world war, these older areas have suffered from economic decline and many buildings were demolished. However, historic buildings still tend to dominate the streetscape of downtown Elyria. Steven McQuillin, Planner, Lorain County Regional Planning Commission, Elyria Multiple Resource Area, Lorain County, Ohio, nomination document, 1978, National Park Service, National Register of Historic Places, Washington, D.C.